Krish and I decided to attend Mysore Dasara this time. 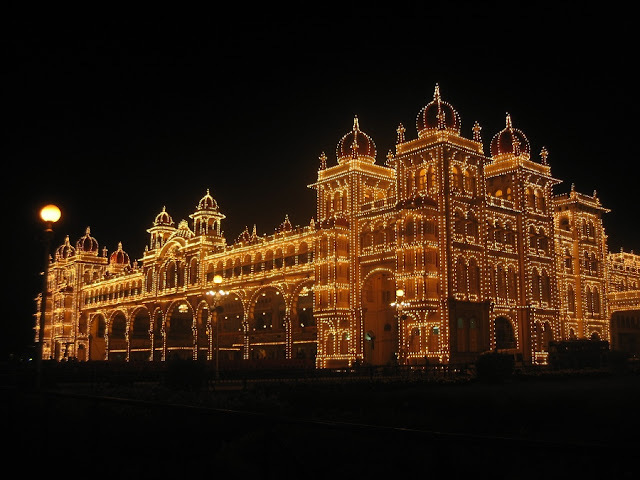 Mysore Dasara is one of the most famous event and people from all over the world want to take home some glimpses of this event. Since a week we have been planning this trip. Events lists downloaded, train and bus timings verified, hotel availability discussed among friends who have lived in Mysore; and all things finalized by Friday evening. On Saturday, the 20th of October 2007, Krish, Seb, Chandra and I met at KSRTC bus stand, Bangalore and we left to Srirangapatna, a place only 15 kms from Mysore. We were told by the sources that it is impossible to find rooms in Mysore thus we thought of this alternate plan. We reached Sriranapatna at noon. Booked a hotel room; the rates were high here too. We managed to bargain 2 rooms for Rs 650. Which is not a good deal but anyway we had our tight constraints. After lunch we booked a Tanga (A cart driven by horse) He said he would charge only Rs 40 per head and show us the entire town. We gladly boarded and began an excellent ride. Srirangapatna is a fort town, the entire town lies inside the fort which now is in ruins. We stopped at the Ranganatha swamy temple. The amazing architecture here is worth a visit. And the magnificent idol of Lord Vishnu sleeping on a Kalinga with Godess Lakshmi by his feet is a beautiful sight. The huge idol is decorated gorgeously. From here we reached Tipu’s Dungeon, were he used to hold captured British soldiers. The sight of the peacefully flowing Cauvery River from here is a famous view point. We then took a ride along the town saw few places like –Palace of Tipu which now is in ruins after a fire completely destroyed it; place where Tipu died and a place called water tank which is the route from where few disloyal men of Tipu showed British the way into the fort. Fort could have been entered only through the river side and this route was shown by two of Tipu’s men themselves; also visited Jama Masjid, which has a nice architect. We then went to Tipu’s summer retreat palace. 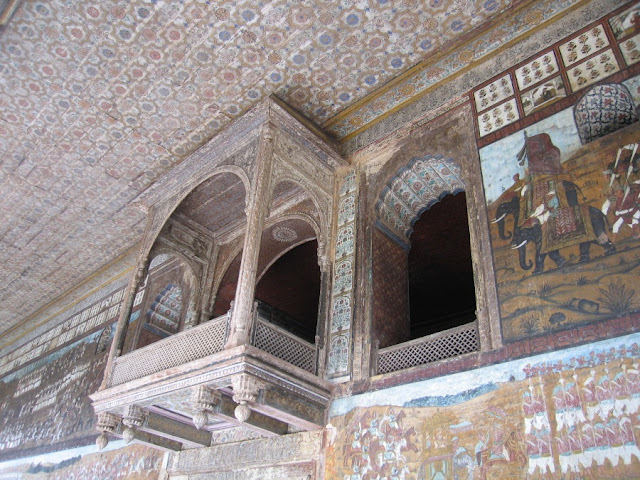 The palace is magnificent and the walls are painted completely with stories of Tipu. Inside the palace which is now a museum are several old paintings. We then left to Mysore. Directly went to the palace. The palace looked beautiful as ever. We watched some folk dance for a while and then came to know that the program we were looking forward to has been moved to another location due to the rain. We quickly took an auto to Maharaja College grounds. I noticed that the auto drivers are not as rude as the Bangalore one’s. They did charge extra but not more than a limit and were very kind and soft spoken. Dance program by Hema Malini is the program we did not want to miss. The program started almost an hour late but was worth the wait. 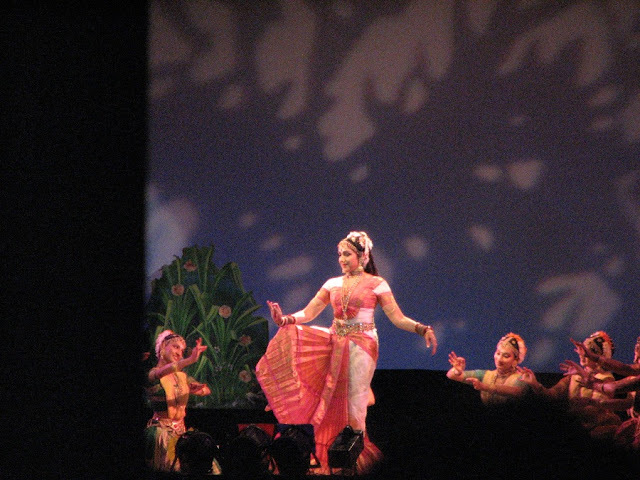 Hema Malini is a wonderful dancer and she performed stories of Sati, Parvati and Durga. We left to Palace at 9:30 PM. We did not want to miss the lighting. The sight of the palace lit up with millions of bulb was a spectacular sight. These pictures speak for itself. On the way back our bus hit an auto rikshaw and the sight of a woman being dragged by the auto was very horrible for me. Luckily no one was hurt. In no time we had replacement of bus through KSRTC. I am always impressed by the Goverment Transportation arrangments. They are very punctual, at least here in Karnataka. We came back to the hotel at 12 and crashed to bed. Next morning I took an early morning walk around the town and watched Srirangapatna wake up. 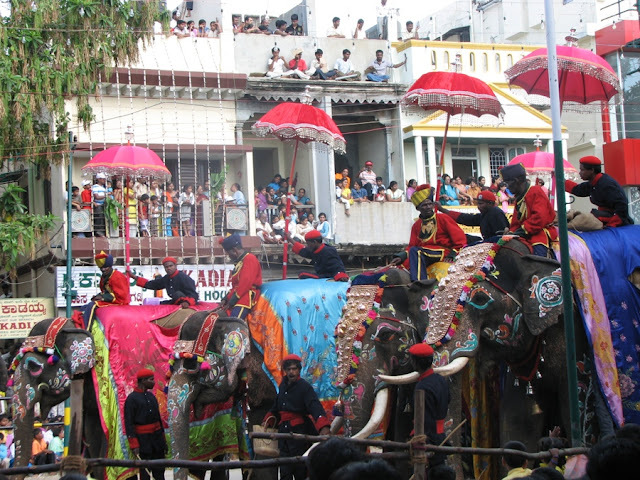 Later we left to Mysore and watched it get ready for the procession. 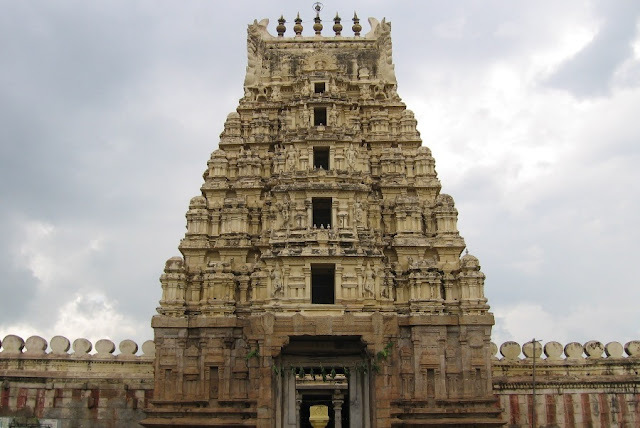 Seeing that there was enough time, we took a bus to Chamundi hills. 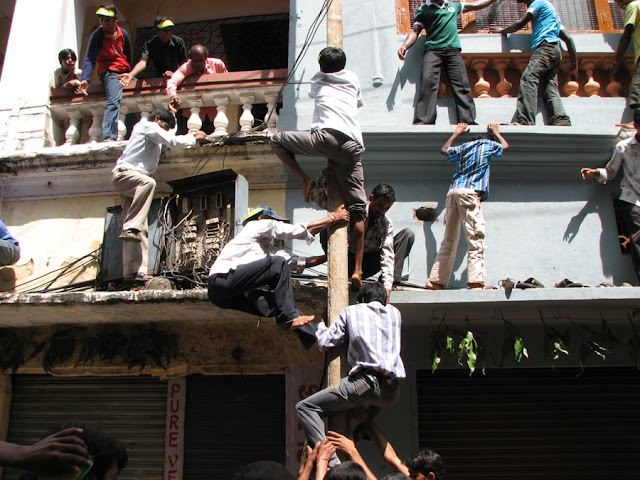 But the driver was too slow and it took a lot of time to reach there and even up there it was terribly crowded. We struggled to find a decent shady place to sit and returned to the palace. Again we witnessed terrible crowd here too. People were sitting everywhere, on the road sides, top of every building, vehicles and it was hard to find a place. 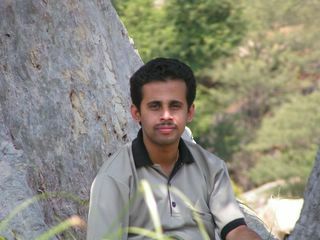 We managed to find some place but could not wait long. The procession was not that great either. I did not find it very interesting though. Decorated elephants were a beautiful sight but otherwise rest was not that interesting. We lost one of our friends in the crowd too. We returned early and took a Volvo back to Bangalore. Government had arranged plenty of buses for this occasion and it is definitely an appreciable effort. WoW...some very beautifully captured shots & lovely reading your description. I read about he Mysore Dasera & its significance earlier. Surely want to visit there sometime! @Kalyan - Thanks. Ya its worth a visit. Great photos and very interesting article. Please come visit my travel blog as well! 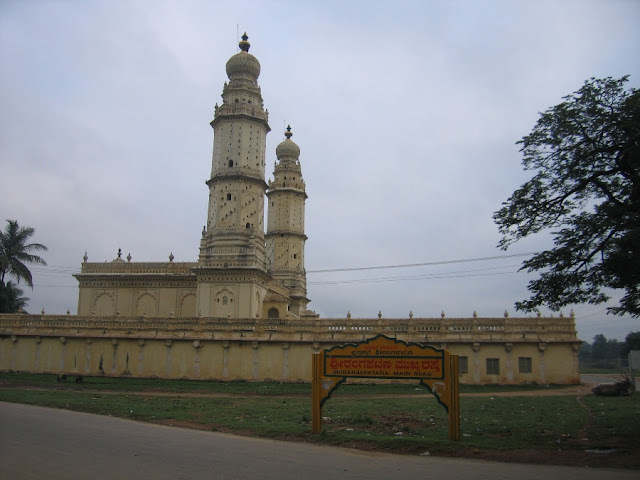 I've been to Mysore and Srirangapatna. Always wished to be a part of Dussehra celebrations in Mysore. But since reading your post, am not that keen anymore. I find the Mysore Palace very interesting. It is exquisite both inside and outside, and especially love to see it lit. @Ashley - Thanks for you visit. I sure will. It is definetly worth watching the cultural programs, palace lighting etc but the procession is not worth that pain. 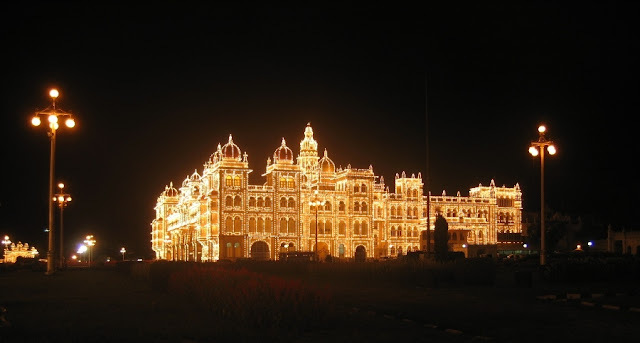 great pics ... mysore is a personal favourite ..find it too crowded during dassera .. Thanks for dropping by. I love the 3rd photo of this post. What is it called? Saffronsaris - Welcome to my blog. The third picture is the palace of Tipu Sultan one of the ruler from south. Being a mysorean, I missed Dasara very badly this time. But, felt good seeing the pictures. Nice post! @Bit Hawk - Glad you enjoyed the pics. Welcome to my blog. @Prashanth - Thanks.. Welcome to my blog. woow ive just enlarged that pic of elephants.